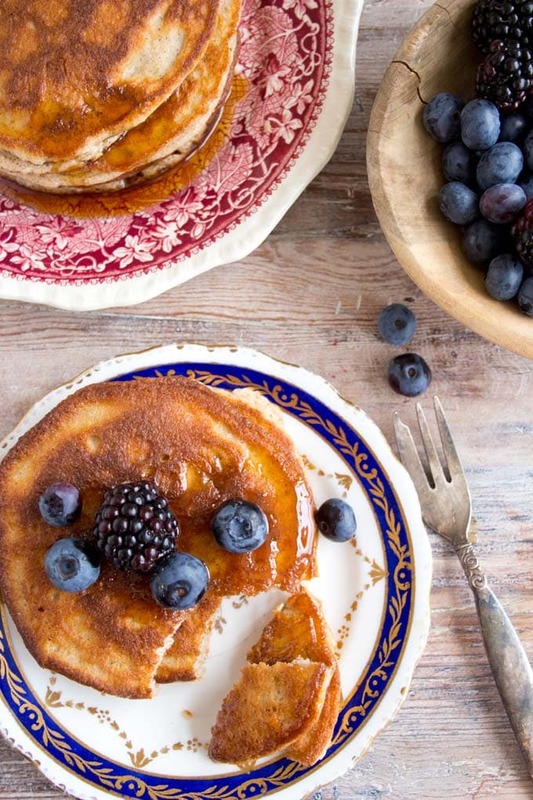 What is it about pancakes that makes them so irresistible? The answer is simple. Pancakes, just like their very close relative, the waffle, are reserved for days you look forward to. They are signifiers of fun, relaxation, enjoying yourself. I have some awesome low carb pancakes on this website already – for example my almond cream cheese pancakes. They use, as the name suggests, almond flour and cream cheese and are one of my most popular recipes. 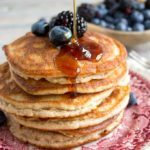 This time I wanted to make healthy grain free pancakes that were extra fluffy extra light and extra thick – and an alternative for my readers who are allergic to nuts. I’m sure you’ll absolutely love these pancakes. Coconut flour is my absolute favourite grain free flour and, as an added bonus, very healthy. It is really high in fibre and has a lovely mild coconut taste. The secret to supreme fluffiness in low carb pancakes? You have to beat the egg white until they form stiff peaks and fold them into the batter at the very end. I used to think it was impossible to get egg whites stiff – until I discovered some very useful tips, listed in my post for this strawberry mascarpone tart. Follow the instructions and it’ll ALWAYS work! You can play with the sweetness and spices in this recipe as you wish. I used 1 teaspoon of mixed spice (that’s pumpkin spice for my US readers). Cinnamon or vanilla extract/powder would be great in this recipe too. 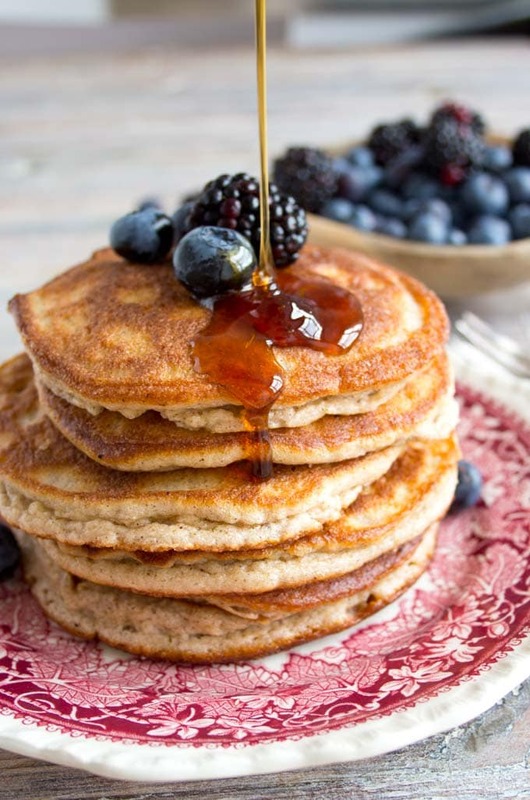 Recipe TOP TIP: The one thing to note with coconut flour pancakes is that you need to a lil’ bit of patience when frying them. Keep your stove to a low or medium heat so they do not burn! If you have a large non-stick (!!) pan, you can make 2 pancakes at a time. Watch’em with hungry eagle eyes and as soon as they start bubbling on top, turn them over. I slathered my pancakes with sugar free syrup and we ate them with berries. If you have time, you could also make this very yummy 2 ingredient sugar free caramel sauce or have them with blueberry jam. Update October 2018: These pancakes taste SUPERB with the Lakanto sugar free maple flavored syrup. Lakanto make very reasonably-priced erythritol/monkfruit sweeteners. At the moment the brand only ships within the US, but they sent me their products to try. I use a bit of syrup in the pancake batter and squeeze more over the finished pancakes. YUM. I have negotiated a special discount for Sugar Free Londoner readers – if you enter the code SUGARFREE at checkout you get 20% off all non-sale Lakanto products! I have successfully toasted leftover coconut flour pancakes on the next day. 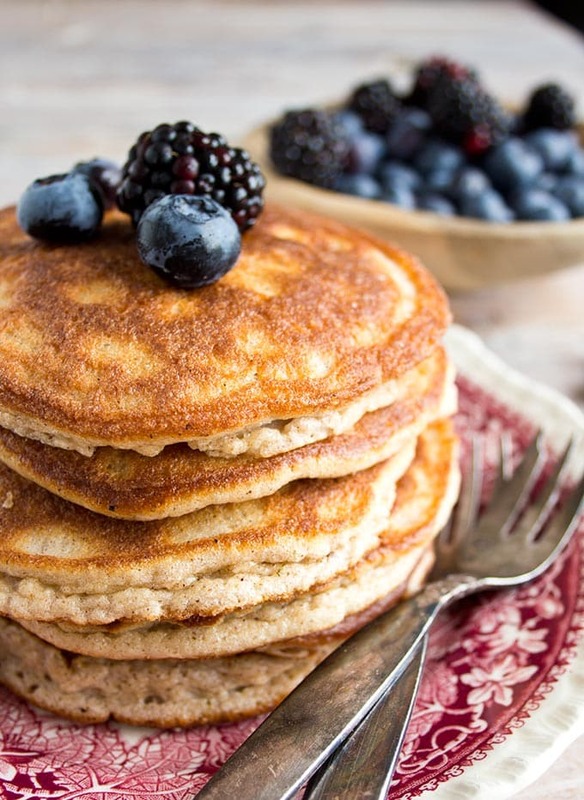 You'll love these fluffy and light coconut flour pancakes! This easy recipe is low carb and sugar free. Melt coconut oil and mix with the egg yolks, coconut flour, coconut milk, baking powder and spice/sweetener, if using. I did this with a food processor, but you can use a stick blender, too. If you just use a fork, sift the coconut flour first so it does not clump and use some serious elbow grease to get the mixture nice and smooth. In a clean metal or porcelain bowl, whisk the egg whites until stiff peaks form. The stiffer you get the whites, the fluffier your pancakes will be! Heat some coconut oil in a non-stick pan. This mix makes 6 pancakes (ca 10cm diameter each) using 3 tbsp of batter per pancake. Fry them over a low-medium heat so they do not burn. Turn over once the top starts bubbling. 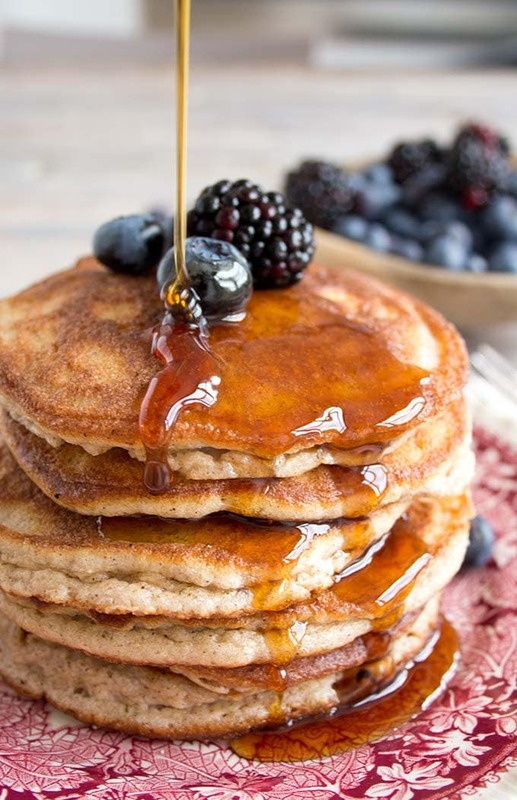 These pancakes are filling - that's the nature of coconut flour. One was enough for me. If you have a teenager, a hungry husband or an active day ahead of you, you might want to calculate two per person. You know your crowd best, so do increase the amounts accordingly! To keep things on the simple side, I have calculated the nutrition info per pancake. Tip: Do invest in a quality pan when you're cooking low carb. Coconut flour pancakes, for example, are more fragile than wheat pancakes because they lack the gluten. You don't want them to stick! I have negotiated a special discount for Sugar Free Londoner readers - if you enter the code SUGARFREE at checkout you get 20% off all non-sale Lakanto products! Hi Ovi, I actually prefer my pancakes with sour cream and fresh fruit. If you make another batch and still can’t get hold of the syrup, give it a go! Do you have a cook book?? Not yet – sign up to my newsletter and I’ll let you know as soon as it’s ready! I have made these a few times now and they taste great! However, the batter has not been a pourable any of those times. I’m melting the coconut oil and using room temperature eggs. Any ideas? The batter is thicker because you use stiff egg whites. It would be pourable if you did not did that. But – that’s what makes them so fluffy! I just made these for my 10 year old daughter, and she LOVED them! She has Hashimoto’s, so finding a recipe for anything that she can and will eat is very hard. Can these pancakes be frozen, and them microwaved? I want to make these for school morning breakfast, but don’t always have a lot of time in AM to cook. Don’t make these when the temperature is cold! I really struggled to get my batter to a decent consistency because my coconut oil kept hardening during the process. I managed to get them to turn out pretty well, it was just a struggle! Good to know Nina, thanks for your comment! Of course you can! This would work in pretty much any recipe. It the batter suppose to be thick? I tried making this recipe but epically. 🙁 the batter seemed really clumpy and runny. Any tip for trouble shooting? Sounds to me that you did not mix the batter well enough? If it’s clumpy and runny at the same time… Coconut flour can be tricky to work with, so next time you make a coconut flour recipe just make sure you end up with a smooth dough. I hope this helps and let me know if you try again! That syrup!!!!! I’ve just ordered it. Looks so good. Great recipe! And everybody who’s making these, make sure you fry your pancakes at a low to medium temperature, just like Katrin recommends. I was impatient and managed to burn my first one! Thank you for your comment Fiona. Shame you burned your first pancake! I did too – even though coconut oil has a very high burning point, coconut flour does not! I am a big fan of your almond cream cheese pancakes. Looking forward to trying this one now. Will keep you posted! They look delicious. Can’t wait to make this recipe! Thank you Keren. Hope you’ll try it soon. These are AMAZING! We just had the most wonderful pancake breakfast. Will make a double batch next time so I have some spares. Would this recipe work for making waffles? Some pancake recipes say to add 1 tbsp of butter if you want to cook them in a waffle maker. You could give it a try! There’s quite a bit of oil in the recipe already so apart from greasing the waffle maker well I don’t think you need any more butter or oil. They might get firmer though as the waffle maker compresses the batter – meaning you might need to use less coconut flour. My tried and tested waffle recipe are these low carb waffles, which use a different egg/flour ratio and butter instead of the coconut oil.